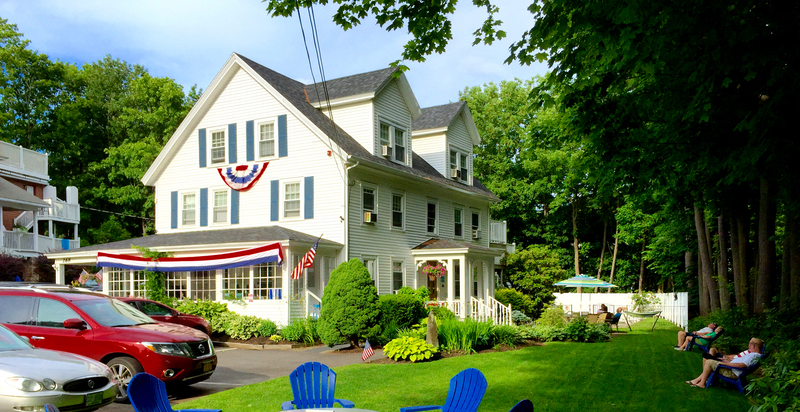 The Abalonia Inn is an 1840’s New England style farmhouse that has been lovingly restored with particular attention to the period detail, including the original post and beams. The Ideal Location! Abalonia Inn is located right in the center of the village, only one block to the Ogunquit Beach and the entrance to the Marginal Way, Ogunquit’s famous cliff walk leading to Perkins Cove. Yet, the Abalonia is set back from the road, and has open gardens so guests are able to peacefully enjoy being in the heart of the village, with its famous restaurants, clubs, and historic movie cinema. Amenities Include: All inn rooms have new Flat Screen TVs, individually controlled air conditioners, refrigerators, wireless internet, and heat. Have more questions? Go to our Q & A page! If you want to see what it is really like to stay at the Abalonia Ogunquit visit our About Us page. Quick spontaneous stay on Saturday! Service is amazing from Jimmy and Alyssa. Room was perfect! Updated and very clean. Pool was perfect loved swimming in the saltwater pool!! Very close to the center of town and everything is very walkable! can’t wait to go back! Already planning our next stay. The Abalonia Inn has a long, extensive, and well documented history. Back in the early 1800’s the Abalonia Inn and the surrounding 12 acres were owned by the one of the founding families of Ogunquit – the Maxwells. Barak Maxwell was the richest, most influential man in Ogunquit. Before the American Civil War he was heavily invested in shipbuilding and the rum/molasses trade with Cuba. In 1855 Maxwell had a 265-ton brig built at his Ogunquit shipyard and named her the “Betsey Ames” in honor of his beloved wife. Captain Daniel Maxwell was a Captain with several world records for the shortest time for ocean crossings.